My grandmother was a smart woman. 16 years ago when I announced my wedding engagement, she congratulated me, told me that Jeff and I were a good match, and then gave me this warning: "Don't let his mother get in the middle of you two. That's when the problems start. You know the way Italian mothers are with their sons." She knew of course, she was an Italian mother herself. Italian men love their mothers. And they love their mother's cooking. The key to getting along with your Italian mother-in-law, therefore, is to praise her cooking. Trouble starts when we attempt our mother-in-law's recipes, then ask our husbands whose is better. It's a deadly trap. Ask an Italian guy who the better cook is, his mother or his wife, and he'll tell you his mother. That is, unless his Italian wife is present. In which case, he will answer that both his mother and his wife are wonderful cooks. Then he will point out dishes for which each woman is famous, such as his mother's lasagna or his wife's eggplant parmigiana. Still, it has taken me nearly 16 years of marriage to attempt her sausage bread. Of all the beloved Italian dishes my mother-in-law makes, including chocolate dipped almond biscotti, stuffed squid, and Easter rice pie, her sausage bread trumps them all. 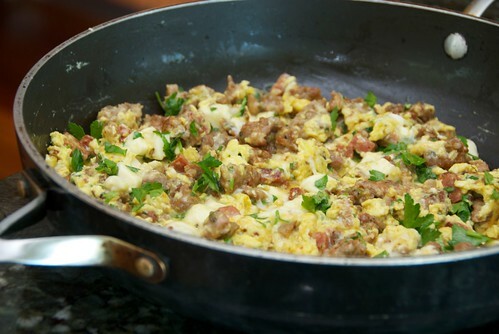 This Easter Sunday treat consists of sauteed hot Italian sausage, pepperoni, fresh mozzarella, Parmesan, eggs, and parsley, all nestled inside of a crisp, golden brown crust. Sometimes the filling will overpower the dough and pop through. Not to worry. 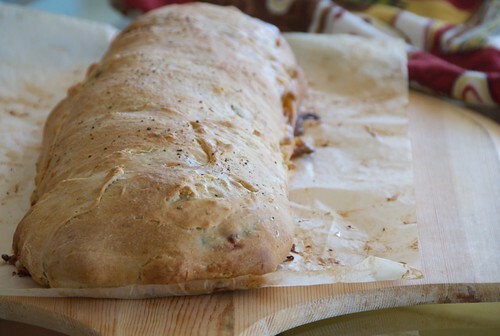 The melty cheese adds to the rustic look of the sausage bread. When my mother-in-law was here last week, I asked her to help me make my first sausage bread. As she cooked, I asked lots of questions and snapped lots of pics, as the rolling of the loaf is critical. Pleasantly, it turns out sausage bread is really easy to make. Just remember to use the best ingredients you can afford, namely Italian deli hot sausage, pepperoni, and fresh mozzarella. And be kind to the dough. Overworking it will weaken it and cause tears through which the filling will escape. If that happens, patch the tear with a little piece of dough. When I served the sausage bread to Jeff and my in-laws last week, I knew better than to ask whose was better. After a couple of bites, though, my mother-in-law announced, "This is delicious! It tastes just like my sausage bread." I beamed the rest of the day. The egg mixture should be partially cooked, as it will finish cooking in the oven. 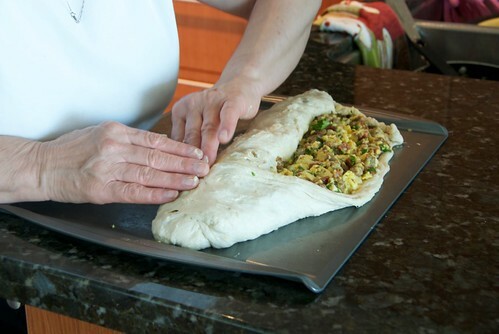 Spread the egg mixture on dough, leaving a 1-inch border all around. Turn the shorter sides of the dough up on to the filling so it won't escape. Then roll the dough into a loaf, in a jelly-roll fashion. When you've rolled it 3/4's of the way across, grab the far end of the dough and pull it toward you, tucking in the egg mixture. Then flip it over, seam side down. Brush it with olive oil and sprinkle with black pepper. Bake until the crust is golden brown. Slice the bread after it cools for about 10 minutes. Make your husband (or anyone you love) happy the next morning by serving him or her leftover toasted sausage bread for breakfast. 1. Pre-heat oven to 425 degrees F, and center a rack. Roll out 1 pound of room temperature homemade or store-bought pizza dough into a rectangle about 10 X 12 inches on an unrimmed cookie sheet coated with a little cooking spray. Cover with a kitchen towel while cooking the filling. 2. In a large skillet, over medium-high heat, warm olive oil. Add sausage. Using a wooden spoon, break up the sausage into small pieces. Cook 8-10 minutes, or until browned and crispy. Add pepperoni. Cook 2-3 minutes. Add eggs, mozzarella, Parmesan, and parsley. Cook 2-3 minutes, stirring several times. The eggs should be partially cooked, and the cheese partially melted and stringy. Overcooking the eggs will make them dry. Let egg mixture cool for about 5-7 minutes. 3. 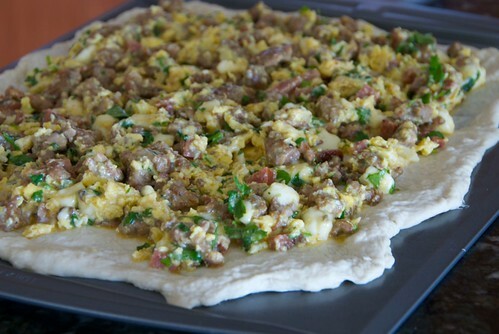 Spread egg mixture on dough, leaving a 1-inch border all around. Turn the shorter sides of the dough up on to the filling. Then roll the dough into a loaf, in a jelly-roll fashion. Turn the roll over with the seam on the bottom. Place in the middle of the pan. (You can line the pan with parchment paper for easy clean up.) Brush the top of the loaf with olive oil and sprinkle with freshly ground black pepper. 4. Bake for 20-25 minutes, or until golden brown and crisp. Cool slightly before serving. Eat hot or at room temperature. Wrap leftovers in tin-foil and refrigerate. Toasted, they make a delicious breakfast the day next. "Nan's Way: The Only Way to Make Easter Pies," one of my NPR pieces that includes recipes for Italian Ricotta Pie with Pineapple, Italian Rice Pie, and Italian Pizza Chena. 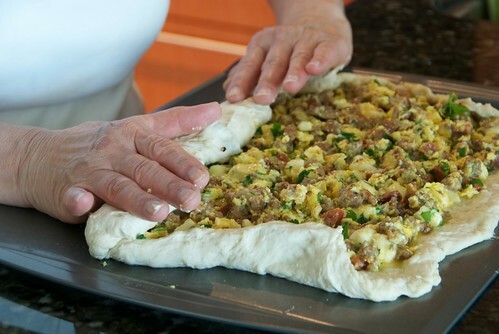 Here's a step-by-step post on how to make Italian Pizza Chena. Good for you Susan, you have mastered your MIL Italian cooking. This looks absolutely incredible!! I need to make it. I only wish my egg-hating husband would eat it. Sigh. I was seated next to a gorgeous local Italian man at a dinner at a cooking school in Italy in 2008 and upon tasting something I had cooked he said I cooked just like his mother. I was sort of deflated thinking he must think I'm old, to which he was quick to add that that was the highest compliment you could give a woman! I'm heading back to that part of Italy on Sunday - can't wait! Looks so good. I can't wait to try it. Ahh, my mother in law can't cook a lick, but OTOH I don't get the benefit of recipes like this sausage bread. This looks absolutely DELICIOUS. Well, my brother's future wife is going to have an easy time of it because my mom is a not-so-awesome cook. She just doesn't enjoy doing it. 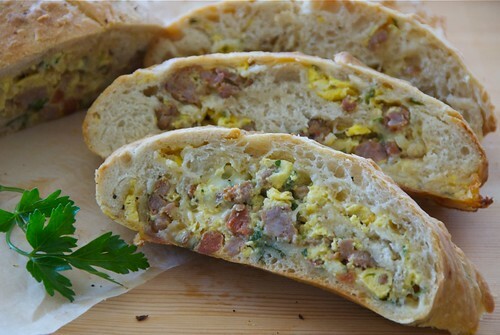 This sausage bread looks amazing! I am definitely going to have to try it. Easter or NOT. I'm so glad my mother in law is German! this looks delicious. The bread looks great and Jeff's happy face is the best testimonial. Oh my! That looks delicious! I'll have to try this :) Thank you for sharing dahling! This looks wonderful. I have saved the recipe. LOVE THIS WEEK!! It brings out all of these very special family Easter specialties...have never seen the bread with the egg like that..love it...what town in Italy is your mother-in-laws' family from? every town has different traditional pies, cakes, breads for this holiday. Thanks for sharing it!! What a great post! You and your ML are lucky women to have each other! This is awesome. It'd be perfect for a brunch party! I am so lucky, my Mother-in-law is famous as the world's worst cook, so no problems there. I am going to treat my dad and hubby to this for Easter - what a treat for all of us - good cooks or not! I have some sausage derfrosted and I need to use. Looks like I need to try this recipe! I don't think I've ever seen scrambled eggs used in a bread filling - that sounds fabulous! Boy, that looks good. I made tsoureki for the first time a couple of weeks ago and loved. Oh, this looks great! I make something very similar to this except the dough has a little milk and sugar in it, so it makes a bit of a sweet bread which is delicious with the eggs and sausage. There's never any leftovers! I was raised in an Italian household and learned to make some wonderful dishes but this is one I have not heard of...probably from another region of Italy than my family. It looks and sounds delicious and I can't wait to try it! Nice post, Susan! Made me laugh. This to me is Pizza Rustica, a traditional Easter dish, though I've generally seen it in a pie form (like made in a bundt pan). Whatever the shape, it's delicious and I can't wait to eat some Easter Day. I had such a wonderful time helping you with baking your first Italian sausage bread It was fun being your teacher vs. always being your student. As I read your blog detailing the entire process it was like reliving it all over again. It was so much fun the first time and a real special treat to see it published. Thanks to you and Jeff for making our visit to San Diego a wonderful event to remember always. This is fabulous Susan! We make it very similar but always used a special cheese called Tuma, have you heard of it? OMG! Thank you SO much for posting this recipe. I used to have this when I was growing up in Philly. An Italian neighbor of ours made it every Easter, but we never got the recipe when we moved away. Now, thanks you and your MIL I'll be able to make it for my family. michele-I hope you meet the good looking guy again. He was probably coming on to you! kitchenmonkidan-It's a great breakfast and welcome change from toast and eggs. joanne-It tastes great any time of the year. maris-Actually, he didn't think I was going to post it. Surprise! kj-It's a typo. Whoops. I'll change it right now. anh-Uh-huh. ;) You're sweet too. foodobsession-I know what you mean. Her family was from the Tuscany region. duodishes-It's ideal. My MIL does it all the time. kevin-I've never made that before. elaine-You're so right about that. There are NEVER any leftovers. gina-You're probably right. I hope you try it! sra-I'm glad to hear it! joan-The names can get so confusing. 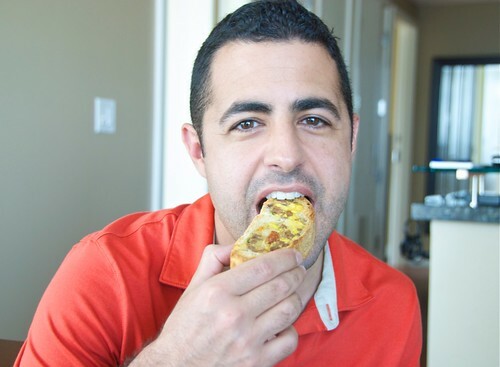 I usually think of pizza rustica as a pie made from layers of cheese, meats, and eggs. They're all fabulous! dorothy-The treat was all mine. You're so easy and fun to cook with. I just wish we could do it more often. We miss you both! prouditaliancoo-I haven't heard of tuma, but I just googled it, and it seems similar to what we call basket cheese -- a soft, fresh cheese. We use that in the Pizza Chena. mary-Well, I'm so happy to be of service! I hope it tastes like you remembered it. Enjoy! wow that looks awesome for breakfast, lunch or dinner! I loved reading your post. Your bread has definitely trumped mine. I cannot wait to make this version as well as your mother's lemon biscuits(cookies)! I loved this post and I'm anxious to try the bread. Although I'm familiar with Easter Pie, this is something new to me. I enjoy reading your blog very much . . .I feel like I'm reading writing from my sister. Looks like a real winner. teachercooks-That's so sweet of you to say. But I'm sure they're equally delicious! rosemary-That's the greatest compliment you could give me. Thank you! lorilynn-She was a smart cookie! I missed this for Easter, but I'm printing this to make for my husband's birthday dinner next week. He will love it!! -Thanks. Karen. Wow, what a great looking bread. I saw this on Marie's Proud Italian Cook and had to come and take a look. New fan here! I don't think Austrian MILs are as cut throat as the Italian variety but I have felt the trepidation of approaching one of her recipes...It was easier than I'd feared, happily. Susan I made this for Easter and posted about it. Can I just tell you... It was Outstanding!!!!! chow linda-Im so glad you did. Welcome! Wow! That looks truly amazing. Beautiful and totally yummy at the same time. I just had to write and thank you for this recipe! I have had in bookmarked for a very long time and finally made it back at Christmastime. It was fantastic but I froze half of it at the time. We are in the midwest and we are literally snowed into our houses right now. I just thawed out the other half of my sausage bread and toasted it up for breakfast! wow-it was maybe even better than it was before. Thanks for posting this! elite entrees-Thanks so much for the thoughtful comment. Oh, toasted for breakfast? It doesn't get any better.